The inimitable Wayne Lundquist Ford, aka "Ice Cream Man," has done it again. For the fourth summer in a row, the tireless Cool One has put together a stellar compilation of powerpop, indiepop, janglepop, rockpop, and otherpop songs and made them available for free download at Bandcamp. We've been eagerly anticipating Songs We Learnt At Sundae School for months now and got right to sampling all 160+ as soon as we found them posted tonight. We're posting widgets of the entire compilation, plus our very favorite songs in two installments. If you want to download the entire comp, click "Download" in the first widget below. To download any of our faves, clicking the song title will take you to its download page. To go to the Bandcamp page of the entire compilation, click here. We would again like to thank Wayne for his effort, expertise, and generosity in making these excellent songs available. Thanks, too, to the artists who participated in the project. 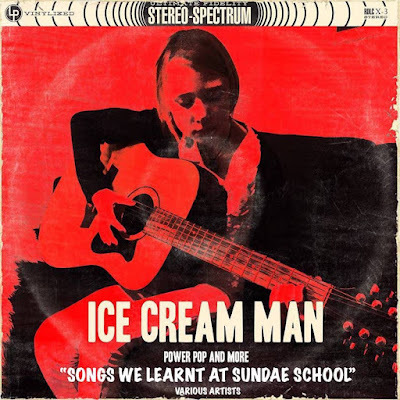 Be sure to check out Wayne's Ice Cream Man blog and give ear to podcasts of his excellent weekly radio show. You can check out our posts of the previous Ice Cream Man compilations here, here, here, and here. Update, 1aug18: Free downloading of the entire compilation is now available courtesy of Futureman Records. (<==Clicky clicky.) If you click on the individual song titles below, the page you go to will show a fee until 8aug18. Many thanks to Futureman Records for stepping in to maintain free downloads. Pause here to prevent brain freeze. Resume when ready. Cheers for sharing and the kind words, kudos to all the great bands out there that make it all possible, without them it would just be me and a kazoo!